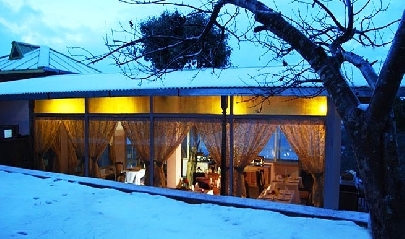 Offering stunning views of the surrounding Himalayan Mountains, Te Aroha is one of the best hotels in Uttarakhand. Lying the serene Dhanachuli village, this resort is a colonial-style summer house that has now been turned into a boutique luxury hotel, offering finest of hospitality to its guests. An amazing amalgam of modern conveniences and traditional architecture, this property still carries its original appeal. Antique furniture, bay-style glass windows with superb views, spacious terraces and deck and lobby with a high-ceiling and specially chose furniture all give the feel of colonial times. A resort in village Dhanachuli, Te Aroha is close to a number of popular tourist places of the region such as Nainital, Almora, Mukteshwar and Bhimtal. 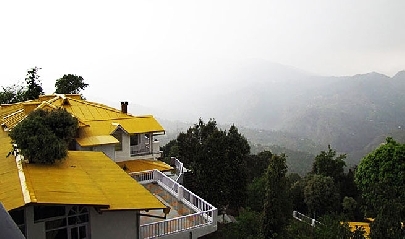 Offering mesmerizing 360 degree view of the landscape of Dhanachuli, the Family Cottage is an ideal accommodation for a family of four, along with a servant. This cottage consists of a furnished high-ceiling living room along with a study, a powder room and a bathroom, main bedroom with antique king-size four poster bed, a huge wooden deck and second bedroom with an attached bathroom. Your servant can stay in the ante room of the cottage. This tempting separate cottage is just the perfect accommodation for a honeymooning couple. Also lovingly called the Place of Love¸ this suite has been carefully designed keeping in mind the themes of love and romance. Offering magical views of the surrounding scenery, this suite comprises of a living room featuring a fire place, a warm bedroom with an antique poster bed and a dressing area. The plush L-shaped bathroom comes with all the modern comforts. One of the most special accommodation at Te Aroha, Master’s Bedroom Suite is a huge suite that is placed in old wing of the hotel and is the original summer house. Consisting of a capacious bedroom with a 19th century king-size bed and a huge living room, this suite offers superb views of the surroundings. While sitting in the private garden, admire the pleasant ambiance. The suite also has a plush bathroom and a warm study room. It was the owner’s bedroom. A well-appointed living room, 2 plush bedrooms and a huge bathroom are a part of the Guest Bedroom Suite. 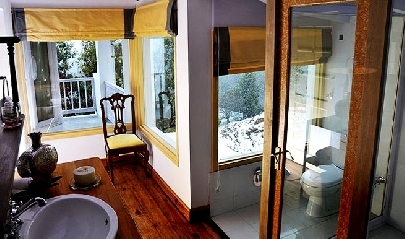 The large glass windows of the well-fitted bathroom offer some stunning views of the snow-covered Himalayas. This was accommodation for the guest of the original owner of this summer house and is ideal for a group of 3-4 adults or a family of four. The king-size bed here has been specially brought from Kolkata. The Attic Suite is the only duplex guestroom of the property. The bedroom is one the lower level and the attic at the next floor is the living room from where the guests can savor some lovely views of the nature’s beauty. Perfect for a family, the bedroom of this huge suite has a king-size bed. There is also an attic that features an antique single bed. The suite is positioned in the new wing of the property. Probably the most romantic guestroom of Te Aroha, Three Steps Down Suite derives its name from the 3 stair steps from the lobby that take to it. This cozy suite has rich upholstery on white-colored French-style furniture resting on clean white floor, offers other charm to this suite that is placed in the old wing. 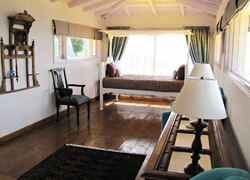 This suite with white ceiling has an all-white well-fitted bathroom with some lovely Himalayan views. Placed on the left wing, devoted to the Women’s global campaign for gender equality by United Nation, HeForShe is a suite with 2 guestrooms that also features a private sit-out area. This front-facing suite is perfect for a small family as it as 1 spacious bedrooms featuring an antique king-size bed and a connected bedroom with a queen size bed for kids. The suite, inaugurated by Ms. Rebecca Tavares, UN Women’s Representative in South Asia, is sans a living room. Mentioned with the same name from the time of its construction, Front Room is place on the ground level of the hotel’s new wing, right in the front. It is called the same now also. From this room, the guests can savor stunning views of the property’s front lawn and the snow-covered peaks. From the private terrace, relish stunning scenic views. The room gets its name from the black-colored wooden roof. Black roof room is placed on the first floor in the new wing of the hotel. Enjoy lovely views of the Himalayas from the two-side. While you sit in your room’s private balcony, the rays of the morning sun greets you. Treat your eyes to the wonderful views of the surroundings beauty. Have a comfortable stay in Morning Sun Room amid contemporary comforts. Placed on the first level of the hotel’s new wing, The Deck Room comes with a wooden deck that spreads from the wide corridor right outside the door. This room features a twin bed. 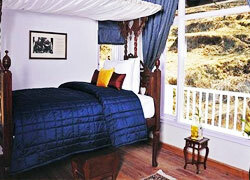 Have a comfortable stay while admiring views of the resort and the snow-clad mountains. Resort’s only room with a single bed, the single’s bedroom adorns a romantic feel and comes with a 19th century four poster bed right from the colonial times. The afternoon sun touches the attached balcony. Called the ‘White Room’ from the time of its construction, this room is placed on the ground level of the hotel’s left wing, right in the front. 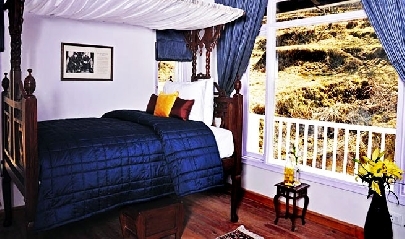 The room features has a comfortable antique four-poster bed and comes with a small verandah from where one can savor some lovely views of Dhanachuli’s landscape. Lying in the corner of the hotel’s left wing, Writer’s Corner Room is an ideal accommodation for book lovers and writers. The room features a bay window close to the study table from where the guests can savor stunning views of the apple orchard. The room is very well-equipped. Elegantly designed as per theme, all the guest rooms at Te Aroha boast of a unique ambiance, feel and décor. Guests can treat their eyes to the breathtaking views of the stunning landscape of Dhanachuli and the snow-capped mountains. 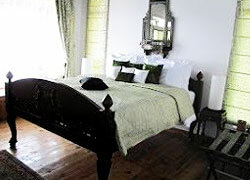 The rooms are very well-equipped and have a wonderful decor. Oaks Restaurant- The on-site restaurant serves lip-smacking delicacies of Indian and Continental delicacies. Regional dishes are the specialty. While having tour meals, treat your eyes to the lovely views of the mountains. 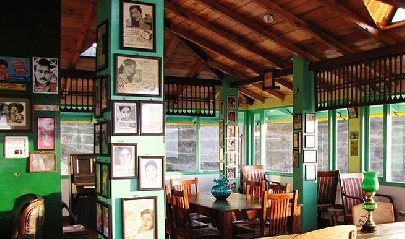 Cafe Flashback- Cafe Flashback lets you savor authentic Indian street food in a warm ambiance. Tea Lounge- Take your cup of hot tea or other favorite drink and simply relax at the Tea Lounge that is placed on the attic level. From the lounge, the guests can relish 360 degree views of the mist-clad Himalayan peaks.